Guardian Anchors are owned by Fortress Anchors and as such have a high reputation for holding power and long life.They make their anchors from unwelded joints creating a more solid and robust end product. The Guardian Anchor can then be taken apart and stored easily. 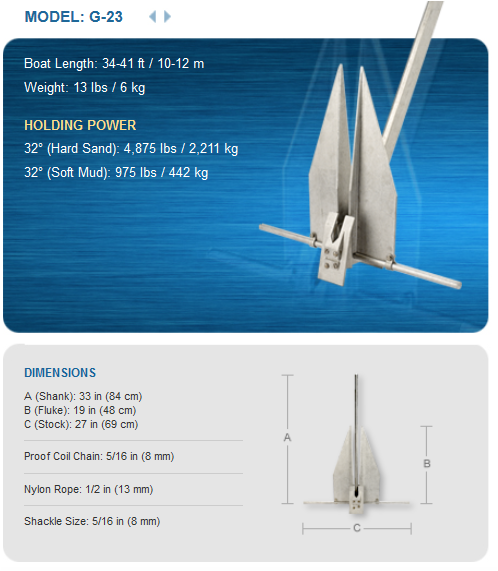 The galvanized aluminium flukes and shaft make the anchor lightweight but still strong enough to hold any boat securely. The G-7 in this case holds 5-7 metre boats but consult the size guide for more information. If you are not sure which size you need still please consult one of our specialists on moorings and anchors on 00353 28 23190. Add chain, 3 strand nylon and 2 x shackles for a full anchor kit (see related products). Benefiting from years of Fortress Anchor Research and Development, Guardian offers excellent quality, performance and economy. Guardian is made from the same high tensile, corrosion resistant aluminum magnesium alloy and manufacturing precision as Fortress. The use of slightly smaller extrusion profiles and the elimination of some of Fortress' extra features, such as anodizing, adjustable fluke angles, and several machining steps has resulted in a very affordable alternative to those heavy, rust-prone steel anchors. 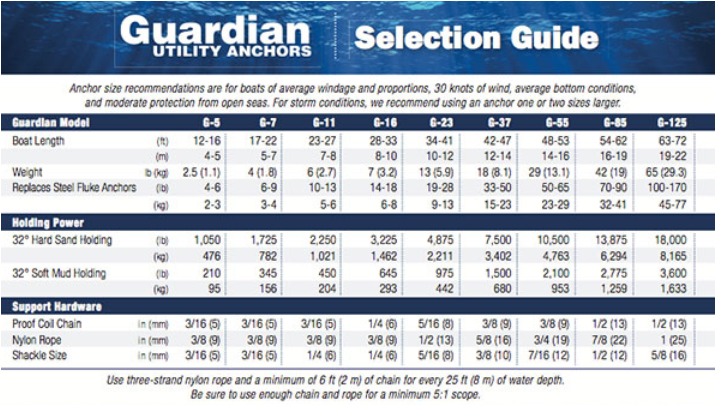 All Guardian Anchors feature Mud Palms designed to help the anchor set faster in any type of sea bottom. Mud Palms create a "lift" to the crown of the anchor, causing the flukes to point more directly to the seabed. This helps the anchor set faster ... in any bottom. Polyform A2 Buoy Red 50" Circ.